AyurVAID Kalmatia is an Ayurveda therapeutic destination perched on a lush hilltop in Almora, Kumaon, spread across 14 acres of greenery dotted by tastefully decorated, stone cottages and facilities that offer you disease reversal and revitalization opportunities in privacy and comfort in pristine natural settings overlooking the spectacular Himalayan mountain ranges. AyurVAID Kalmatia in the Uttarakhand mountains is the undoubted destination for patients with multiple, complex, chronic, systemic diseases, seeking enduring freedom from strong painkillers and steroids, or exhausted with the challenges of poly-pharmacy (multiple medicines and its side effects); or those who wish to avoid surgery; or those who simply wish to experience the power of the most authentic Ayurveda for chronic disease cure and enhanced health, delivered professionally. Pure Ayurveda, uniquely personalized to suit your health needs, can now be experienced in the most salubrious of environs here. Delicious, healthy, vegetarian cuisine complemented with dinacharya (daily health routine) and with Ayurveda therapy, including Panchakarma modules, that detoxifies, de-stresses, reverses disease and restores well-being. Diseases that do not respond for many years show dramatic improvement in the pristine settings of AyurVAID Kalmatia, where the focus is on providing positive health benefits, going beyond temporary symptomatic relief. This 14 acre idyllic slice of heaven on earth was discovered nearly one hundred and fifty years ago in 1867 by a British Captain ES Jackson. 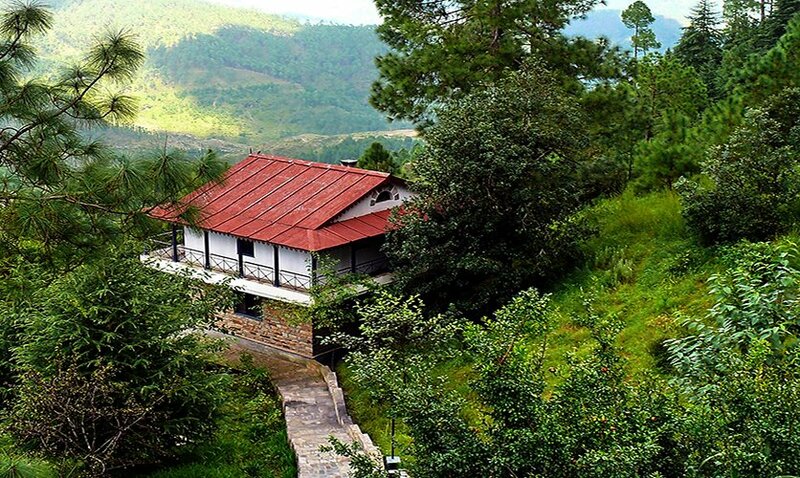 We are set atop an opulent hilltop just 7 km above overlooking the town of Almora in the pristine Kumaon Himalayas. Kutiras (Chalets) reminiscent of the British blend with the green modernity.-Kriyashala, Solarium, Jacuzzi & more. Panchakarma Therapy at AyurVAID Kalmatia are mind-body-spirit healing modules, purifying the body & restoring well-being. When youth blends with experience. Our team of an Ayurveda doctor couple & care givers, well guided by professionals. Wake up to soothing music in the stillness of Nature. Savor revitalizing Ayurveda. Trek the Himalayas. Be pampered to sleep. Visual is our memory and visual is what the senses relish. Be ready to be spellbound as you flip thru’ the pictures of AyurVAID Kalmatia. All roads lead to Kumaon where we graciously await your arrival. Getting to us is a journey of seamless revelation, and of discovery. Use your medium of choice, or intermediaries of trust. We fortify trust as we exude accommodation, of mind, body & soul in caring & cures.